Drum corps fans! The countdown to the start of the 2011 Drum Corps International Tour has begun, which means now is the perfect opportunity to make sure you've got yourself outfitted for the summer season. 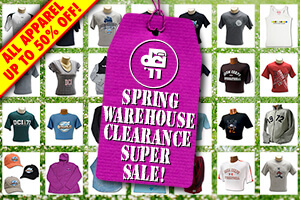 We're blowing out prices on apparel that's taking up shelf space in our Indianapolis warehouse. That means for a very limited time, you can save up to 50 percent on hats, T-shirts, sweatshirts and more. This sale will only last until noon ET on Monday, April 4.